Here’s a good book about American History for girls. “Can one girl save the Revolution?” asks the cover of The Ride. 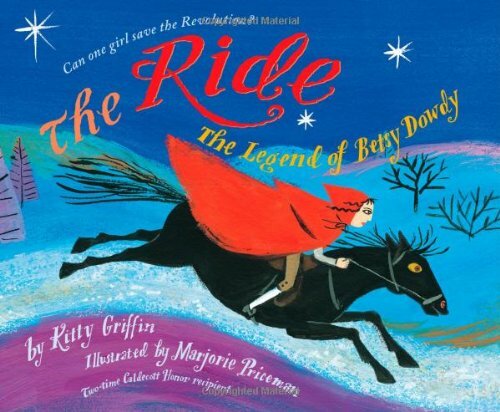 The book tells the inspiring true story of a young girl named Betsy Dowdy who performed her own version of Paul Revere’s famous ride. “In Elizabeth City, North Carolina, the Daughters of the American Revolution named their chapter after Betsy Dowdy,” explains an author’s note at the end of the book. It’s a colorful children’s picture book, but it was based on her legendary real exploits more than 200 years ago. Betsy packs her supplies – a wool cloak, a knife – and scratches a note for her father with white chalk on a piece of slate. She whistles for her horse, telling her “We’re riding for freedom,” and then fords across the cold water of the river. The night air is cold as she rides through the forest, and after many miles she explains her mission to a ferry boat owner, and begs for a ride across the river. “You’re a pepper pot, Betsy Dowdy,” he says, and it is a very exciting story. The book’s illustrations are very colorful, sometimes filled with bright and engaging yellows and sometimes with dark, moody purples and blues. Illustrator Marjorie Priceman had already won two Caldecott Honor awards, and her simple style is fun and effective. As Betsy leaves the ferryman, she’s shown galloping again through the purple night-forest of North Carolina. “Liberty is our dream,” says the ferryman, and Betsy repeats the word to comfort herself. She sees a snarling fox, and she’s even knocked off her horse by a tree branch. But her horse neighs for attention, and she takes it as a sign to continue. And eventually an orange light rises as she reaches the militia rebels’ camp. This would be a great book for children, because it makes the American revolution accessible to even the youngest readers. (At the general’s camp, there’s even the flag with a snake labeled Don’t Tread On Me.) It’s got everything you could want in a children’s picture book – it’s fun, it’s exciting, and it’s brightly-illustrated. It teaches a lesson about perseverance, and about history – but it’s also just a really great read.